I apologize for the late notice on this - I just got back from visiting my parents for Thanksgiving and there is very limited Internet access at their house. I hope some of you are able to take advantage of this special offer! Barefoot Books is once again offering a 20% discount if you enter the code HARVEST at checkout! The discount is good through Monday, November 28th, so there is still time to place an order. And remember that you can still receive free shipping if you order $60 or more! 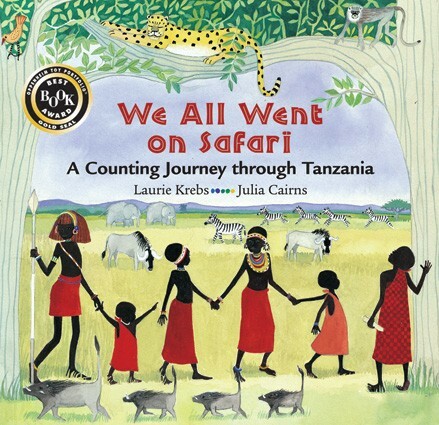 Let's continue on our journey through the travel books of Barefoot with a trip to Tanzania in We All Went on Safari, by Laurie Krebs with illustrations by Julia Cairns. As with so many Barefoot Books, the illustrations in this book are simply gorgeous and full of details. Each page shows a Maasai family traveling through the grasslands of Tanzania, counting animals from one to ten in English and Swahili. 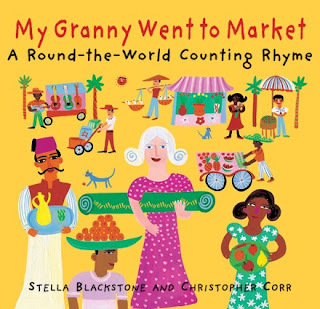 Don't be deceived by the simple rhyme and the fact that the counting only goes to ten - this is a book that your child will be able to read and enjoy and learn from for many, many, many years (the official age range from Barefoot is 4 years old to 10 years old). Older children can learn from the detailed end notes, including a map of Tanzania, more Swahili words, and information about the Maasai people and their way of life. As if all of that weren't enough, a portion of the proceeds from the sale of each book is donated to the African Wildlife Foundation, which has been working since 1961 to help African nations design successful long-term strategies for conserving their wildlife and wilderness areas. We All Went on Safari is available in hardcover for $16.99, and there is also a paperback version in Spanish for $7.99 (though it is currently out of stock). We All Went on Safari is also part of the Barefoot Books for Africa program, in which you can have a hardcover copy of the book delivered directly to a school or library in Africa for just $5. Remember, just two days left in the Global Giveaway - make sure you enter before Wednesday for your chance at the Grand Prize and to receive a special discount code good for the rest of the year! With just a few days left in the Global Giveaway contest, I thought I'd highlight a few of Barefoot's travel-themed books. Let's start with My Granny Went to Market - A Round-the-World Counting Rhyme! Three fierce and funny masks from Mexico! Six booming drums from Kenya! Nine kites that fluttered in the breeze from Japan! and a magic carpet too! The pictures are colorful and fun, and you can count Granny's purchases one to ten on the last page. I think every kid should have such a generous and adventurous Granny! My Granny Went to Market is a paperback, available for $6.99. And if you use the discount code you get when you enter the Global Giveaway, it will only be $4.89! I don't include very much about my personal life here - that's what my other blog is for - so you may not know that the past year has been financially stressful in the extreme for me. Being a single mom has been much more expensive than I anticipated, and two cuts to my hours at work plus huge increases in my health insurance premiums - among other increased expenses - have really taken a toll. I thought things would get better when my daughter started public school this past September - no more daycare costs, hooray! - but instead it seemed like things got worse and I can't even figure out how or why. But now, I do really think we have rounded the corner. I received a very large tax refund yesterday, which will allow me to pay off one credit card entirely and pay down half of the other one, in addition to catching up on all my other bills. And, the tax refund came just in time for me to place a very large order of Barefoot Books stock so that I can be a vendor at a school fundraiser in early December. It will be my first time selling Barefoot Books in person at an event, and I have heard that this particular event is always very successful for Barefoot Books Ambassadors. I'm getting some fantastic help and advice from my team leader - who has done this event in the past - and I'm super excited to be taking another step in the right direction with my Barefoot career. All of which has me thinking about this catchy tune from the book Up, Up, Up! It's been going through my head non-stop lately! Up, up, up, up in a balloon. Up so high I can touch the moon. Up, up, up, sailing with the clouds. Look at me! I'm so high, I can fly, I know how. If you are reading in a feed reader, click through to the blog to see the video. Things are definitely looking up for me, how about for you? Don't forget to enter the Global Giveaway - you have until November 23rd to enter to win an Apple iPad 2, among other things! Barefoot Books is celebrating the release of their new World Atlas by giving away prizes every day! Enter before November 23rd for your chance to win! Just click the picture at the top of this post to enter the giveaway! The Grand Prize, for one lucky winner, is an Apple iPad 2, copies of all of Barefoot's Travel the World books (over 30 books total), and a Barefoot Books gift certificate worth $50! In addition, every day one winner will be chosen to receive a copy of the Barefoot Books World Atlas and a $30 Barefoot Books gift certificate! AND, everyone who enters will receive a discount code for 30% off your next purchase at the Barefoot Books website - the discount code is valid through the end of December 2011! You only have to enter once to be eligible to win, but you have to enter before November 23rd - go do it now!